ALBERTON – Some new state land is now ready for public recreation, thanks to some enthusiastic volunteers. 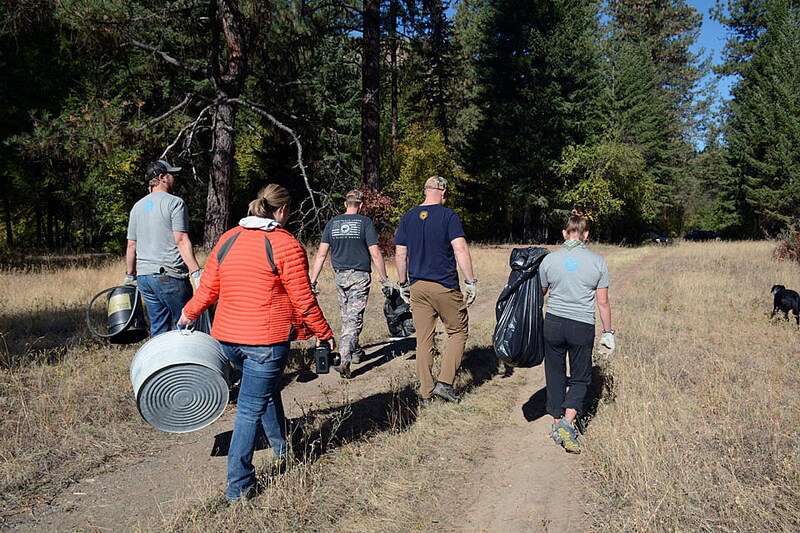 As part of National Public Lands Day, members of Backcountry Hunters and Anglers bent their backs Friday morning to help Montana Fish, Wildlife & Parks restore land along Fish Creek. It’s a parcel that FWP will soon be able to add to the 35,000-acre Fish Creek Wildlife Management Area. But before FWP biologist Liz Bradley can take down the private-property signs, she wanted to clean up the 50-years’ worth of refuse left behind by “Brownie,” the reclusive old man who lived and recently died on the property. Bradley had hoped to do the cleanup in August, but the state kept pushing the property’s closing date back. The deal should close at the end of September, but now, with hunting season ramping up, FWP employees have less time to do cleanup projects. So Bradley was pleased to get a call from the Backcountry Hunters and Anglers. The BHA arrived with three large pickup trucks and needed every one, plus Bradley’s work truck, to haul out all the garbage. Scattering throughout the property, the volunteers came back carrying a trove of items, from old Skoal cans, coffee cans and beer bottles, to tires, sheet metal and even the trunk lid from a 1950s Plymouth. 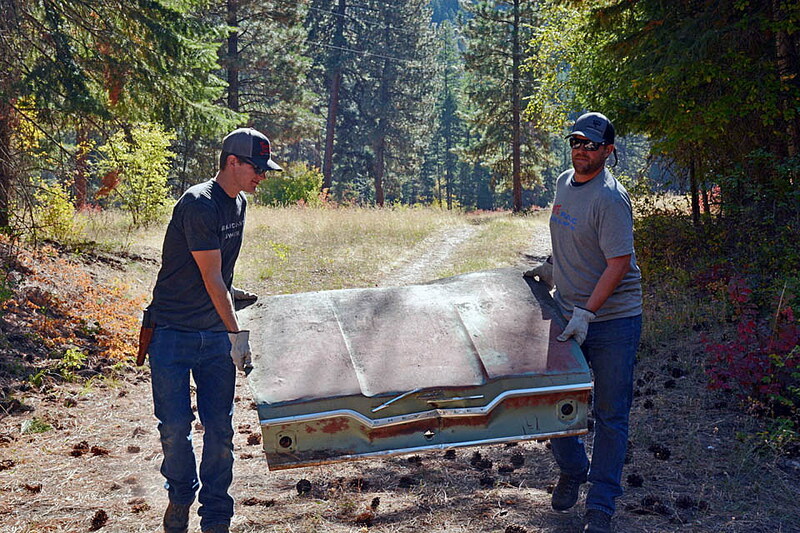 Kevin Farron, BHA Montana Chapter Coordinator, unearthed the rusting springs and frame of an old mattress and threw it on the pile of metal to be hauled to Pacific Steel and Recycling. As the volunteers hunted for garbage, they found signs that the area will soon make for good game hunting. Matted grass showed where deer had bedded down, and piles of bear dung dotted game trails. “Many people will appreciate this property, from hunters to anglers. Now it’s here for wildlife too. And they’ve obviously already moved in,” Bradley said. The 160-acre parcel – which provides access along more than a mile of Fish Creek – is part of a 276-acre acquisition that took more than two years to complete with the cooperation of landowners, nonprofit groups and FWP. Vickie Edwards was the regional FWP biologist in 2010 when FWP finally mustered enough funds to purchase the 35,000 acres from The Nature Conservancy. The Nature Conservancy had bought the land from Plum Creek Timber in 2008 with help from federal Land and Water Conservation Fund money as part of the Legacy Project. Although Edwards had been happy with the new wildlife management area, she knew the piece where Brownie lived needed to be added, if possible. Fish Creek is home to one of the healthiest bull trout populations along the middle Clark Fork River. Once Brownie died, Edwards – who had moved on to work for the Five Valleys Land Trust – then got to play a part in securing the property for FWP. She reached out to Koch and guided him through the long, complicated process of working with the state, although she thought she’d lose him a couple times because he was getting a lot of offers. Finally, this year, with the help of a $10,000 donation from Trout Unlimited and $60,000 worth of mitigation money from NorthWestern Energy, the state land board approved the use of $830,000 from the Habitat Montana fund to purchase the Koch property. As Edwards watched the volunteers erase almost every trace of human habitation, she had a satisfied smile. “There are so many places to be disappointed in the process. But to have one come together and work out, you gotta celebrate those victories. We’re glad to be a part of it,” BHA project organizer Gerhardt Soeffker told Edwards. Saturday is officially National Public Lands Day when more volunteers will be helping care for public land around the Missoula area. For those wanting to volunteer, the Five Valleys Land Trust is sponsoring a trail-building effort on the south side of Mount Dean Stone. Milltown State Park is looking for volunteers to help repair trails in the park.